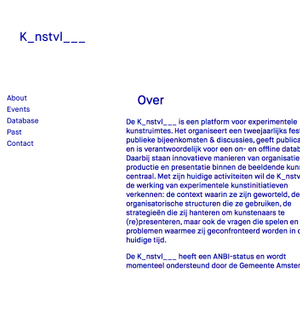 K_nstvl___ is a platform for experimental art spaces. It produces events like a biennial festival, public discussions, publications and an on- and offline database in which it focuses on innovative methods of organisation, production and exhibition making. It wants to investigate the organisational structures that art spaces use, the context in which they are started, the strategies they employ to (re)present the artists or topics they show, but also the questions they have and challenges they are confronted with in current society. 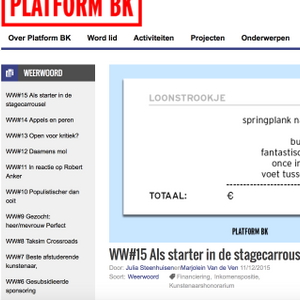 Weerwoord text for Platform BK about the difficult (financial) position of the young art historian. 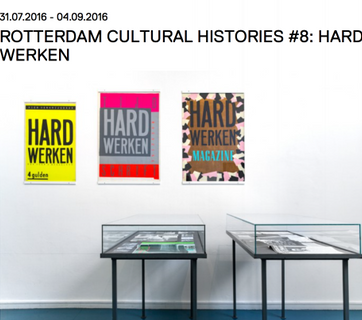 TENT Rotterdam and Witte de With Center for Contemporary Art present an exhibition about the magazine Hard Werken as part of the series Rotterdam Cultural Histories. Between 1979 and 1982, only ten editions of this cultural magazine were published, yet it had a significant influence on a whole generation of graphic designers in the Netherlands and beyond. Curated by Reyn van der Lugt and me. 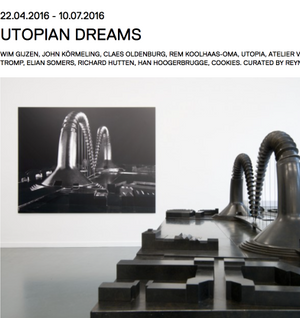 TENT Rotterdam shows the plans and dreams of artists and architects for a new Rotterdam in the extensive group exhibition Utopian Dreams. As part of ‘Rotterdam viert de stad!’ (Rotterdam celebrates the city! ), collector and former museum director Reyn van der Lugt compiles a number of historical and contemporary future fantasies about Rotterdam. I assisted Reyn van der Lugt as research curator.